The Elgin Valley, a short drive from where we live, is known as the place in South Africa “where the apples come from”. This region is one of the most intensively farmed districts in the country and produces 60% of the national apple crop. The varieties are endless and in season, nothing beats the crunch of a fresh apple. We live 4 houses from the local primary school and in order to get across the main road, there is a pedestrian crossing. In the mornings and afternoons the crossing is ‘manned’ by the sweetest gentleman. People hoot as they go past to say hello and he always has a friendly wave and smile for the drivers. He is there every school day regardless of the weather. Sadly, this pedestrian crossing is not acknowledged by all drivers and so his job is vital. Over the weekends when I walk to the shops I can stand for 5 minutes while cars stream past, not thinking to stop. This is so odd as in Europe you just walk onto the pedestrian crossings and the cars stop for you. It does of course take a bit of getting used to. The other morning I was late for work, and at 7am the traffic out of the side road onto the main road is a nightmare. The traffic officer kindly stopped the cars for me, making sure I could get into the road without too much frustration. He knew I was late, even joking about it by pointing to his watch. One weekday afternoon when I was walking to get groceries he told me how that very morning he and a child had nearly been run over by a car who failed to notice the stop sign he holds out, or the torch light he uses to light the way for the children. In his usual manner he smiled after telling me the story, and walked with me to the crossing to help me safely across the road. I have been so touched by this simple act of kindness that next time I think to make a baked apple pie I will have to take him a slice as thanks. Sounds like a great guy. And I know he will appreciate this amazing looking pie! That pie looks amazing. I wish I lived in a smaller town for when he goes to school ? I need to make this pie soon! Hi Tandy, love apple pie, so cool that you live so close to the apple region. Lovely looking pie. love a good apple pie! gotta have it with that ice cream! The weather has finally become cooler in Brisbane. Perfect recipe to welcome a slow coming Autumn and soon to be winter! I think the hot custard will go down a treat! 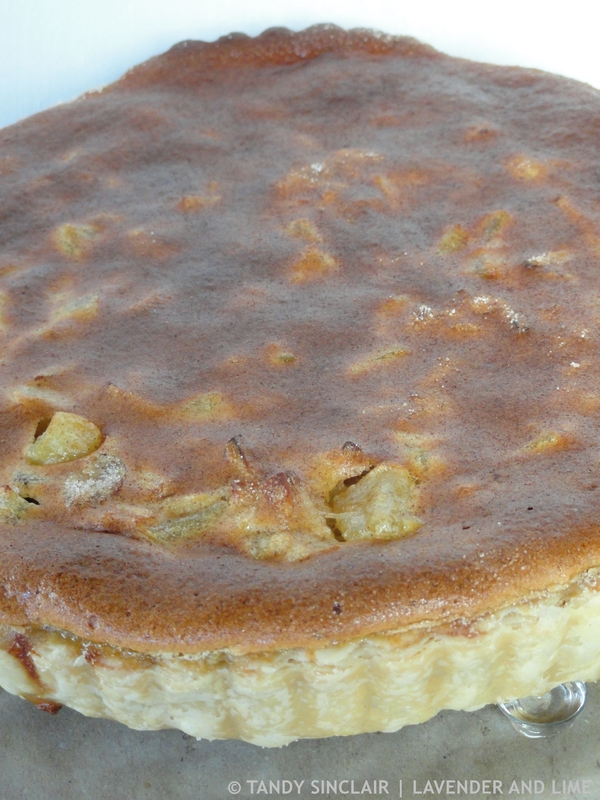 What a sweet gentleman… I am sure he will love a slice of this delicious looking apple pie! What a nice idea to bring him a slice! And in Australia people usually stop but I always have to check when I go overseas because not every city/country is like this. Apple with cranberries, sounds yum! What a lovely gesture of you. Hope he love it! So sweet that you’re making this for the nice crossing guard. How thoughtful! It looks delicious. Apples desserts tops my list for favorite snack. I’m sure he’s taste buds will soar. He deserves the whole pie!! Yummo! this looks very delicious Tandy. it is apple harvest time here so there are lots of crisp apples around. nothing better! Anthony loves apple pie in all forms though I think it’s a little overrated. 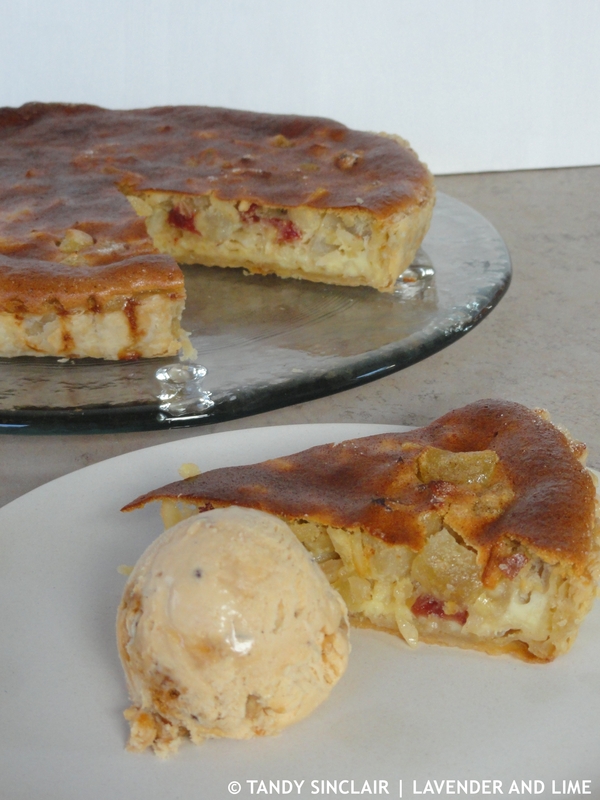 Having said that, I like the idea of a pie with apples and custard/batter filling. As to the school zone, we live in one too and have similar problems with drivers that just don’t seem capable of obeying the rules. This morning a parent was part of the traffic problem, stopping at the stop street to let the kids out of the car instead of driving to the drop off zone! Cannot beat home made apple pie! I am sure he would appreciate this pie for sure, it looks so good. Montreal pedestrians are famous for walking anywhere on a street. Cars usually stop, usually lol. We have the same problem here with pedestrians using the road instead of the sidewalk! Oh wow this is stunning. I’ve never had an apple pie with a custard filling like that before, but it looks absolutely divine. Aww Tandy – what a sweet gesture to take that The traffic officer a slice of this decadent apple pie the next time you make some – he is gonna love it for sure!